Born in a family of musicians, Robinson Khoury began music with singing. Then he joined the children’s choir into the Opera of Lyon in 2003. 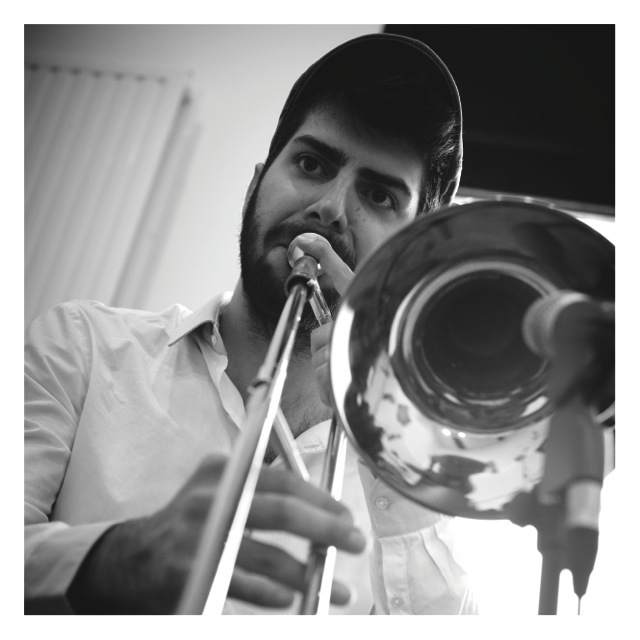 While seeing the Big Band of his father, he chose the trombone wich he began to practice in 2007. In 2009, he participated in the creation of a french-australian sextet in Sydney for a jazz festival. When he was 16 years old, he joined the class of Michel Becquet in the « Conservatoire National Supérieur de Musique et de Danse de Lyon ». In July 2012, he won an international prize of jazz trombone in the « Jay Jay Johnson’s competition » of the International Trombone Association. He created then his own musical project « Uptake ». With this band, he also received several awards including the competition « Rézzo Focal Jazz à Vienne » in late June 2014. This quartet played in numerous festivals (France & Italy). He’s regularly asked for being soloist, what led him to play with famous trombonists like Bill Watrous (Slide Factory, march 2013) & Bart Van Lier (Lille, may 2014). He also won the prize of the jazz soloist in « La Défense Jazz Festival » in July 2014, Paris. Having played in all the scenes of Lyon, Robinson is called to record in New York in January 2015 with Tom Pierson’s Big Band where he met Lew Soloff & Blue Lou Marini. It was also the occasion to play with great musicians as François Moutin, Ari Hoenig, Joel Frahm & others.